Deciding to encapsulate and make other remedies with my own placenta following the birth of my fourth baby was a decision that came easily. As a Placenta Remedies Specialist, I know many other specialists in Ireland and Limerick that would have happily done the service for me, which could have been considered the “easier” option. I knew I would have postnatal recovery to deal with and a newborn to care for following my home birth. After much thought and consideration, I opted to process my own placenta because I felt deeply connected with both it and my baby. My placenta was the organ uniting my baby and I for nine months, after all. It allowed me to nourish my son and I was grateful for it sustaining my pregnancy. Processing my placenta myself felt like the perfect way to end my pregnancy journey. I also had all the proper equipment, the safety knowledge and my husband nearby who was willing to help if and when needed. I know I am lucky to have all this, especially a partner who was willing to help! My son decided his birthday should be December 27th. His home birth was everything I wanted it to be and my midwives were more than supportive when I told them about my plans to consume my placenta. Sadly, I did experience a bit more immediate postpartum blood loss (but not a haemorrhage) than I anticipated. On the day of my son’s birth I was ecstatic to meet him but I admit that the after effects were more challenging than I expected. I was far more tired and weak than my previous births. I consumed raw placenta smoothies following my previous birth and I did again this time. Raw placenta smoothies are full of both stem cells and growth factors that assist with postnatal recovery. I felt having them again this time was especially important because of the additional blood loss I experienced. I had quite the cocktail of smoothies! From strawberry, banana, orange, mango, blueberry- I tried many different flavour combinations but my favourites had coconut milk added. I had five smoothies with raw placenta over the first three days. As a result, my energy levels were up, my skin tone started to improve quickly (which my husband even noticed!) and most importantly for me, I felt like my mood and hormone shifts were more balanced. I didn’t feel that hammering hormone drop as intensely as some women describe. Only 48 hours after birth, my milk also came in! I knew my body had made the shift from colostrum when my newborn started audibly gulping during feeds, I could see a milky ring around his lips while he nursed and I even hand expressed some of my milk. My breasts also became engorged, a definite sign that breast milk has come in! This is incredible because I have a history of polycystic ovaries (PCOS), which creates hormone changes that can negatively impact milk supply. I felt all of this after only five smoothies! I really began to look forward to my pills and other remedies! On my second postpartum day, I decided to make two remedies a placenta essence and tincture, I have never had the opportunity to try them personally, but have made them for clients in the past. Both remedies were quick and easy to make once I had my equipment and supplies. My husband helped me make both as I wore my son in a sling and did what I could to assist. I cannot wait to try these remedies! I’m saving them both for use once my capsules are gone. A placenta essence is a more gentle remedy made using distilled water and 40% alcohol often used during times of transition, illness, stress, for hormone balancing and can even be given to babies who are teething or experiencing colic. A tincture is a bit different as it is made with all alcohol and is a stronger remedy often used for emotional stability, immune system boosting, PMS and/or menopause symptoms. Many women would use the tincture over the essence if they know they are done having children and would use it as needed versus daily. I really wanted to make both the essence and tincture as they will last indefinitely and I can decide when I would like to use them. 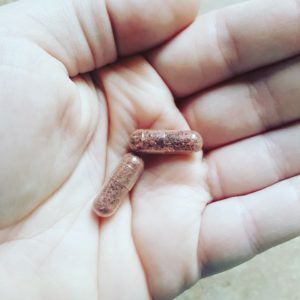 The placenta encapsulation process started on the third evening following my son’s birth and I admit, I’m happy my husband could help. I was still very tired, not quite feel like myself and it was difficult for me to stand for any length of time thanks to postnatal back pain and weakness. 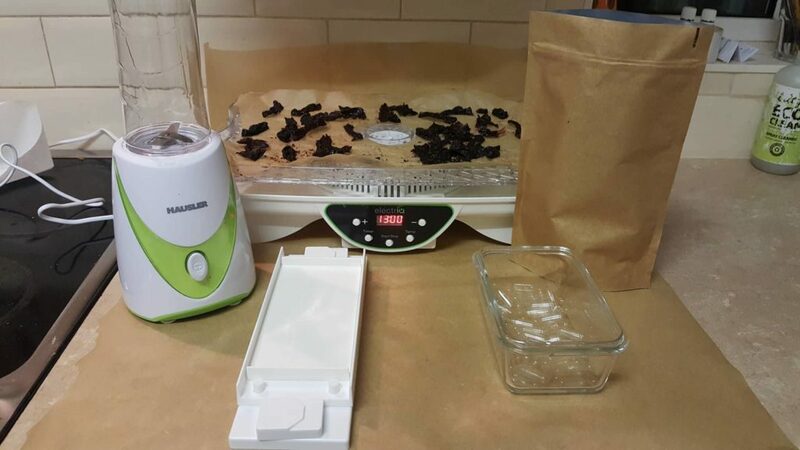 After quickly weighing and rinsing my placenta (which in total weighed over 700 g- or 1 1/2 lbs), my husband prepared it for the dehydration process for simple (raw) capsules. I decided not to make steamed capsules out of personal preference. My newborn was happily in a sling again as I supervised my husband after explaining what to do and helped with clean up. I also excitedly snapped a few pictures! After rinsing and weighing, my placenta was cut into very thin strips. These thin pieces of the placenta, the umbilical cord and membranes were then laid out on dehydrator trays and dehydrated for just over 14 hours. The following evening the pieces of my placenta, which were now completely dehydrated, were put into a blender and pulverized to a powder. 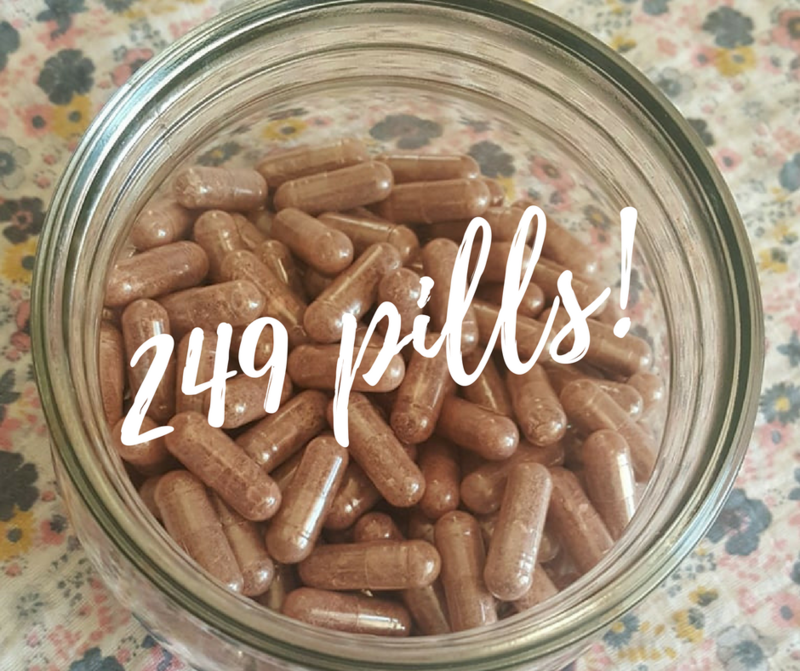 I quickly taught my husband how to use my capsule filling machine and he worked for well over an hour making 249 pills from my placenta! I was thrilled with that amount of pills and if I’m honest, a bit shocked because raw pieces had already been removed to make the smoothies, essence and tincture. Overall, I’m very thankful I had my husband at home and willing to process my placenta. He did the majority of the work with minimal complaints and with me mostly giving instruction. I’m sure I would have been able to process my placenta on my own but having someone I love and trust help me with everything was convenient and ideal. I did become a bit emotional as I saw the last of my placenta lose its shape as it was being sliced and put on the dehydrator trays. There was a sense of gratitude, love and connection flowing through me as I reflected on my pregnancy, saw the placenta that sustained that pregnancy being transformed, as I also snuggled the beautiful baby that was a result of the entire process. Coming around full circle as my placenta was processed in my own home was wonderful to experience. My journey with my placenta continues. I just received two lovely homeopathic remedies, one for me and one for baby, made using my placenta powder by a registered homeopath in Kerry, Ireland. I’m also using some of my placenta powder to make a cosmetic grade facial oil and balm for topical use. I intend to use them myself but also on my son. There are so many remedies people can choose from and I have clearly decided to really treat myself and utilise them all! The best part? These remedies, that are a true labour of love, will benefit me for years to come! Michelle Mayefske is a Birth & Bereavement Doula and the owner of Limerick Doula Services in Ireland. She became a Placenta Remedies Specialist with IPEN in 2017. When she isn’t dealing with all things pregnancy and birth, she enjoys spending time with her four children and travelling.